If you are a nonprofit organisation or charity why is looking to build awareness for your campaigns have you considered using a chatbot? 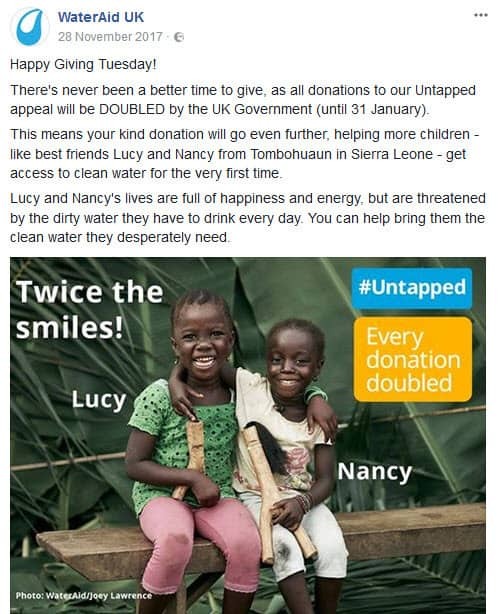 Here is an example from Wateraid who developed a chatbot for their Untapped winter campaign on Facebook. Rather than integrating the chatbot with their Facebook page, they created a separate page for the chatbot. The Untapped campaign was focused on attracting donations for to help bring clean water to a village in Sierra Leone called Tombohuaun. 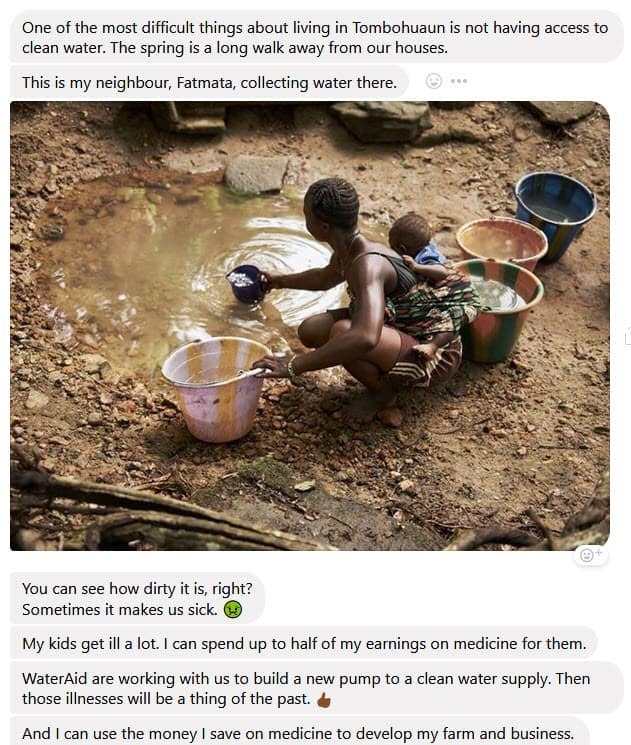 On the Wateraid facebook page they promoted the chatbot with a post directing you to the new Facebook page. 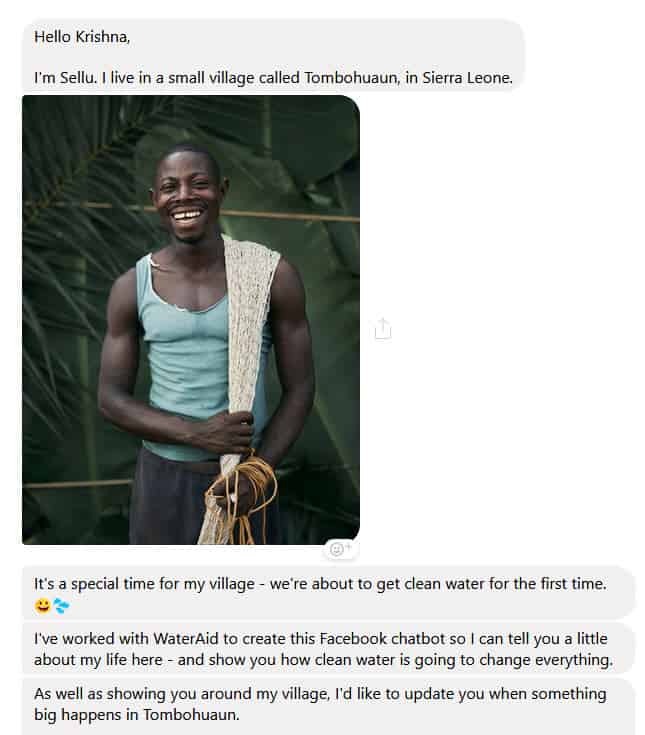 When you navigate to the new chatbot Facebook page and connect through Messenger you get an introduction to Sellu and are invited to learn more about his life in the village. Through the use of multi-media, you learn about life in the village and why there is a need for clean water that will be provided through the Wateraid campaign. You can learn about village life, the water supply and also how to donate to the campaign through the Wateraid Messenger bot. It’s great to see a UK charity using a chatbot for storytelling to help people learn more about the background to a campaign. 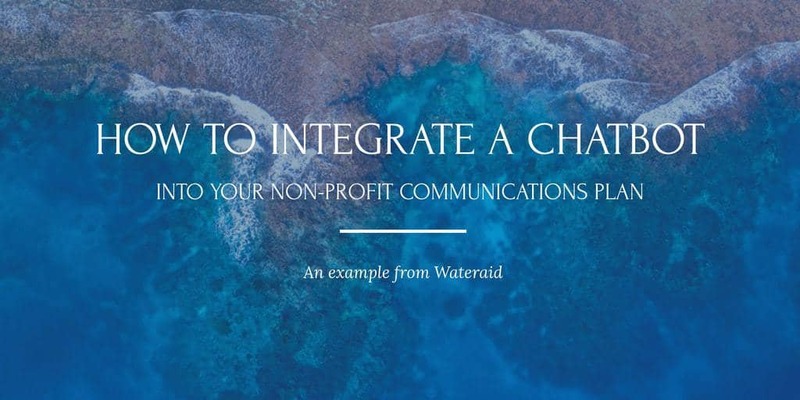 If you have a non-profit this could be an approach to consider – you could integrate calls to action such as how people can get involved in your campaign, volunteer, donate or even help you share the campaign through their networks. 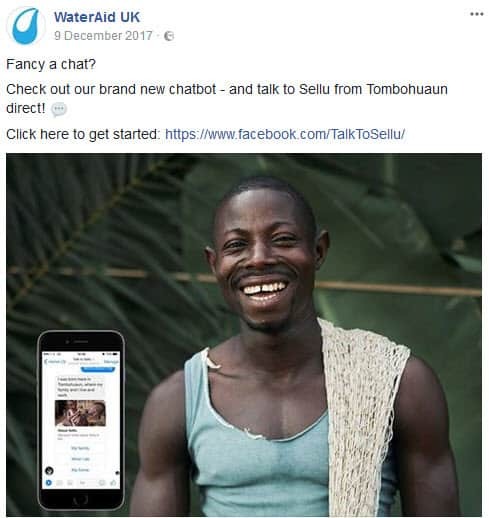 The Facebook page for Wateraid has over 92,000 fans and yet the specific page for the chatbot “Talk to Sellu” has just over 360 fans at the time of writing this article. Unless there is a strategic reason such as piloting a chatbot, the chatbot does not connect with your core business or a compliance reason, I recommend integrating the chatbot with Messenger on the main Facebook page to benefit from connecting with the audience who you have already shown an interest in your organisation. Promote the chatbot through all the online and offline channels open to your disposal and remember that you need to give people a reason to benefit from interacting. 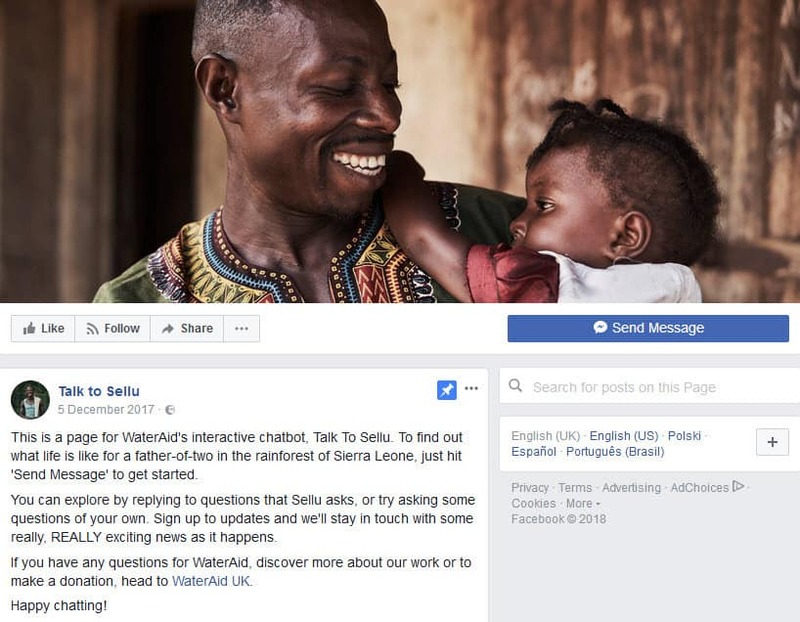 Wateraid published a post on their Facebook page during December 2017 introducing the chatbot, but not really explaining the benefit to people to interact with it. For example, they could have referred to it on their blog, in a news release on their website, on the campaign landing page and even on the Facebook cover image on their main Facebook page. They could also use targetted advertising for example using Facebook ads to promote the chatbot. Give people the option to access the chatbot direct – in the case of Wateraid theiy promoted the url of the Facebook page rather than the link directly to the chatbot – as many people still do not understand chatbots, make it as easy as possible for them to get right to the bot through using the url. Just as with Facebook pages or other social media platforms, when building campaigns on these sites, it is important to also explore ways to encourage people to join your email list – some enterprise bots I discuss in my workshops for PR and communications experts have done a great job in doing this. Wateraid could include some interesting ways to encourage people to joining their email list too. In case you are interested, the platform used to create the Wateraid Messenger bot was The Bot Platform – it’s definitely worth taking a look at for your non-profit or enterprise bot. And while it is not free it provides you do get great tech support from the team to help you develop your bot. This mwans your marketing and communications team can take a key role in the development of your bot if you are not working with a digital agency. Having checked out the The Bot Platform myself, I can also vouch for it having the best documentation of any bot platform I have taken a look at to date – this is one of the key hurdles to overcome if you are new to creating your own chatbots as many platforms have not yet invested in documenting bot building processes. And having spent time speaking with their CEO, I can assure you they are working on GDPR compliance. If you have questions about how to integrate multimedia storytelling into your campaigns, you can schedule a confidential conversation with me here.